When you decided to subscribe to a plan, you need to enter your credit card data to the appeared Credit Card form. The entered credit card will be used for payments according to the selected payment period. NOTE: The billing period will start when your 14-days free trial finish. You don’t have to enter you credit card details to get a Trial! For payments processing we use Stripe payment system. Please note that the Credit Card form is provided by Stripe API, so your credit card information is sent directly to Stripe, ensuring sensitive data never hits our servers. 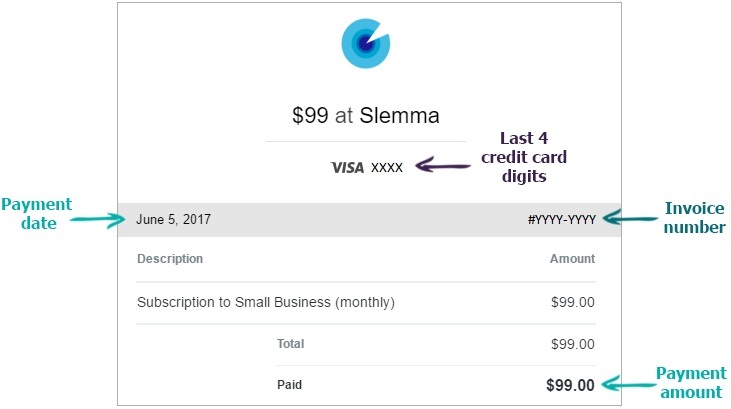 If there is another payment method that suits you more, please contact us at help@slemma.com and we will do our best to provide it for you! After you made a payment, you get an invoice automatically by email. All the invoices are sent to the owner of a Team. NOTE: If you didn’t receive an invoice, please first check the SPAM box. If you need more detailed invoice, please contact us at help@slemma.com and we will send you the special one. When writing us, please attach your info: the full name and address of your company and VAT number (if needed) to the message and we will include it to the invoice. To modify your credit card information, go to Admin > Payment details. Click Update at the Card Info line. Within the appeared Card Info form enter the new credit card details and click UPDATE. NOTE: Only the owner of the Team can access and manage Payment details. If your team members and clients have READ ONLY access to Slemma, it is caused by the fact we didn’t get your payment. Payment fails usually occur when your bank declines it for any reason. The most common reasons are the card number or expiration date are incorrect, or you don’t have enough funds available to make a payment. Read only mode implies that your team members and clients can’t create/edit/share objects in Slemma, and no data refresh takes place. To let your team work, you should make a payment within 7 days. After 7 days, in case of we still didn’t receive your payment, your Team will be deactivated. Deactivation means a Team doesn’t have access to the system and shared objects don’t work. After 60 days, your Team, including team members, clients, and all the objects from Library, will be deleted from Slemma permanently. Yearly. Slemma provides an automatic refund for the unused paid period from the point you claim the refund. The subscription is cancelled instantly. Monthly. Slemma doesn’t provide a refund for this type of subscriptions. The subscription is cancelled after the end of the current monthly billing cycle. NOTE: Refunds may take up to 10 days.